A couple of days ago, Lin Junjie released the new version of Due. I’d recommend you to read Federico Viticci’s review at MacStories and Sean Korzdorfer’s tips on how he use Due, if you haven’t already. Compared to other apps on my home screen, I open Due more frequently on a daily basis. Other than the obvious visual changes, these are a few things I love about the new version. Due 2.0 supports 12 configurable quick-access timings, including the new relative timings. One of the great features in Due 1.x is its excellent natural language parser. Combined with four quick-access timings, it allows me to quickly (and often times, programmatically) create a new reminder. The new 2.0 version keeps the natural language parser and adds a set of eight quick-access timings. You can configure these timings to fit your needs. The new timings allow you to create a relative timing (such as +1 hour and -1 day) in addition to the fixed timings (such as 6 AM and 7 PM). For example, I created six fixed timings based on my daily milestones and another six relative timings to easily move a reminder to a different date/time. Group messaging is definitely a known problem. Different people have their own group messaging problems. The #1 problem in group messaging is always on finding that lowest common denominator platform within the group. Dealing with mostly iPhone users may lead you to use iMessage exclusively. But, if you have to deal with Android users, you may have to rely on cross-platform solutions such as WhatsApp or SMS. There are also other impromptu needs that are not suitable for SMS, e.g. sharing the group photos you just took with newly-met business associates or sending notes to all the meeting attendees. For these cases, you may have to rely on emails instead. Regardless what your needs are, the built-in iMessage and Mail apps in iOS are not built for sending these messages quickly on your iPhone/iPad. For example, you can’t easily group (and ungroup) people in your Contacts list whom you frequently send messages/emails to. Sending multiple photos from within these apps is not easy, either. Fortunately, Contrast — the development team behind Launch Center Pro — just released two new apps aimed to ease these problems: Group Text+ to send group iMessage/SMS, and Email+ to send group emails. Both GroupText+ and Email+ offer a new approach in the way you manage your frequently-used contacts. I’d suggest you browse your existing behavior in both iMessage app and your Sent Mail folder to determine the best way to use this feature. Both apps allow you to create pre-defined groups (such as Co-workers, Family, etc. ), add individual contacts, and rearrange them in any order. Each time you want to send a new message/email, you can mix and match these icons to fit the needs. For example, you may want to share your holiday vacation photos with your co-workers, family, and one specific friend you meet during that period. This article was meant to be published on the same day when iOS 8 was available. But, we all know the story how Workflow was rejected for having buttons to launch itself in the Today View extension. After waiting for months (and removing said feature), finally Workflow is available for everyone today. If you love iOS automation, you’re probably already aware of Launch Center Pro and Drafts. Together with URL Schemes and x-callback-url, they form the backbones of iOS automation. Well, today we have a new app that hopefully can make it easy for non-geeks to create their own workflows. 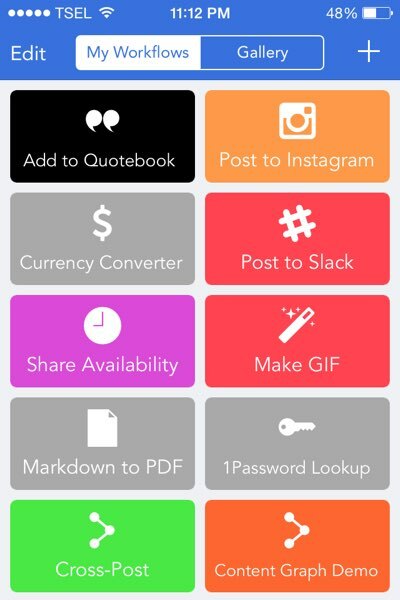 And, here are a few reasons why I believe you would love the new Workflow app. Workflow arranges its actions as tappable banners, similar to an Apple TV layout, scrollable to support (almost) unlimited number of actions. Workflow is designed to help you create automation workflows visually and easily. You don't need to understand how URL Schemes and x-callback-url work to create your own workflow. Everything is drag and drop. And, it can support as many actions as you want to include in the workflow. In less than 48 hours ago, Drafts 4 was released. It's a major update released as a separate app. I'd suggest you read Alex Guyot's excellent review in MacStories. He covered many things that highlight why Drafts 4 is such a great update. With those out of the way, I will now focus on the ones that I will cover in more details. Because Drafts 4 is released as a separate app, it can co-exist with Drafts 3.5. And, I believe this arrangement makes it easy for existing users to migrate their notes and custom actions to the new version. First, you need to have both apps installed on your device. Then, you can export all or some of your notes. Because Drafts 4 uses Flagged instead of Pinned to keep things more akin to typical email clients, all your pinned notes in Drafts 3 will be exported as flagged notes in Drafts 4. Contact Center is a simplified version of Launch Center Pro dedicated for communication with people in your Contacts list. Launch Center Pro is well known for its flexibility and power, especially among the iOS automation geeks. But, I'd argue that many people use Launch Center Pro a bit differently than how most geeks would. That's why the Contrast team releases a brand new app to address the non-geek audience. Called Contact Center, the new app is a simplified version of Launch Center Pro, focused more on making it easy to communicate with people in your Contacts list. Instead of allowing you to write deep-links or create a chain of actions, Contact Center lets you create shortcuts to call, message, email, and more. That's why Contact Center uses a different set of terms than what Launch Center Pro uses. It uses shortcut instead of action, and folder instead of group. 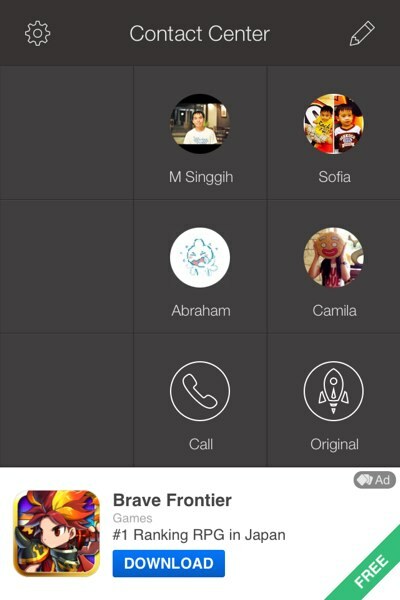 Other than these changes, Contact Center looks and works very similar to Launch Center Pro. So, you can fill in the grids of shortcuts with direct shortcuts or folders of shortcuts. Contact Center allows you to create a folder of shortcuts based on an entry in your Contacts list with a single tap. One of the advantages that Contact Center offers is how easy it is for anyone (even non-geeks) to setup various ways to contact someone. Simply tap the '+' button on the top right corner, and choose the Folder from Contact option, and watch how Contact Center generates a new folder containing shortcuts surrounding how you can communicate with the contact you selected. The folder will use the Contact's first name as its name and the Contact's avatar as its icon. This feature also acts as a nice showcase of how you can use Contact Center to its maximum potential. For example, in this initial release, Contact Center will generate Call, Message, Email, FaceTime, FaceTime Audio, WhatsApp, Message GIF, and Message Camera shortcuts.